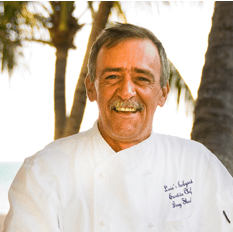 Chef Doug Shook has been the unseen genius behind Louie’s cuisine for 26 years, drawing on culinary influences from around the world. Doug’s relentless commitment to quality and his endless experimentation and exploration of tastes result in four to five menu changes each year. He is an artist; whether it’s finding the perfect amount of calamondin juice to brighten the flavor of a yellowtail snapper or the creation of a new oriental salad, his skills are Louie’s palette; your table is his canvas.